1. 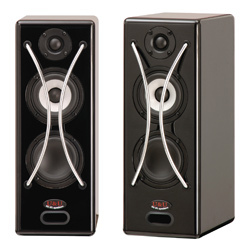 UCS-3 is not only a bookshelf speaker, but also it might be as a front/ rear speaker in the home theater systems or as the surround sound on the wall. 3. Brand name: U & U, OEM and ODM are also welcome. 1. Woofer: 1 x 3＂(90mm) polypropylene cone woofer driver. 2. Mid range: 1 x 3＂(90mm)glass fiber cone Mid-range driver. 3. Tweeter: 1 x 3/4＂(20mm)silk soft dome. 4. Overall frequency response: 60 ~ 40KHz. 5. Sensitivity: 82dB ( 1m/1W). 6. Impedance: 4Ohm. 7. Power handling: 10 ~ 40 watts. 8. Dimensions (H x W x D): 345 x 130 x 195(mm). 9. Weight: 3.5 Kg.